My mother always was very much against guns. As a kid, I never had a toy gun, outside of the occasional water pistol. Mind you, I really wanted to have toy guns and I would greedily claim any available weapon at friends' houses before playing "war" or any other violence-based games. At home, though, I was, as they say on the mean streets, without a "piece." I think people may overreact to the violence issue when it comes to kids -- especially boys. I don't think it is violence boys crave so much as a clear metaphorical dry run at contending; a theatrical platform for practicing the attainment of glory. I was not a violent kid. I never fought if I could help it and when I did, I was pretty philosophical about it. But, for a long time after having seen Rocky (a film I stand behind in terms of its artistic quality, despite the charicature Stallone allowed himself to become) I wanted to be a boxer. But the truth is, I didn't want to be a boxer. What I wanted to be was Rocky Balboa. I still do. As a ten-year-old boy, I entranced by the sharply-chiseled story of a genuinely nice guy with very little intelligence and nearly no moral support who did what he set out to by virtue of sheer tenacity and courage. I find Rocky a beautiful film. I am still moved by seeing Rocky tell his girlfriend, Adrian, on the night before the championship fight, that it doesn't matter if he wins of loses; if he can still be standing at the end of fifteen rounds, everyone will then know that he wasn't "just another bum from the neighborhood." And that's exactly how it ends: Rocky doesn't win, but he accomplishes his goal: he stays on his feet and proves he is not just another bum from a dirty Philadelphia street. And isn't that what we all want to do? -- just prove that we are something more than a 98.6 degree sack of water lumbering from birth to grave with nothing extraordinary to contribute to the human timeline? The fight in the film is life. Rocky is not about boxing -- it's about living. And I think that playing war is not about violence and killing. I don't really believe it makes our kids violent. I think it gives them a framework for playing at striving for the extraordinary. Stallone took care to depict Rocky as a kind, loving, downtrodden fellow facing a world that is way too big for him. What he does is what we all do: he fights. Our kids stand four feet tall in the middle of a summer lawn, in the middle of a town, in the middle of a state, in the middle of a country, in the middle of a world, in the middle of a planet, in the middle of a universe, wanting, instinctually, to tell everyone that they mean something. If defeating evil enemy troops with fake guns helps them to do that, maybe we can overlook the pretend violence -- as long as we help them keep perspective along the way. Probably close on ten years ago now, I read a piece in some teaching magazine someone left in the faculty room at the school where I taught in which a mother described her efforts to raise her two sons as nonviolent individuals. This included no allowing them any toy weapons. 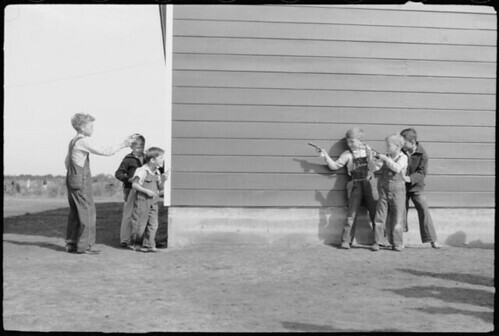 Which meant of course that every crayon and stick became a gun or a sword in her boys' hands. Later, the older boy became a discipline problem and something of a bully at school. The psychologist from whom she sought help pointed out that when she said "You can't have a toy gun, guns are bad," what she was really saying was "guns are scary, and when you have one you are scary, but I'm afraid you won't be able to control it." On the counselor's advice, she started letting her boys have toy guns and swords, with rules like "don't ever point that at a person." The change she described in her sons after that decision was nothing short of miraculous. Toy guns weren't so much about teaching her sons not to be violent, as they were about how to handle the scary and possibly dangerous things in life thoughtfully. How much that has to do with Rocky I don't know, but I think of it every time I hear a parent proclaim their kids aren't allowed toy guns. 'nora -- that is a fascinating story. Another testament to the danger of over-simplified views. The violent suface value isn't the end of the picture. In te case of your story, the benefit of looking below the surface was quite clear. Thanks for sharing that. Patty -- Yup. It is an age-old thing, writing stories to reflect life's journey. It's best when they show hope, I think.